Changing preparations takes a little time. 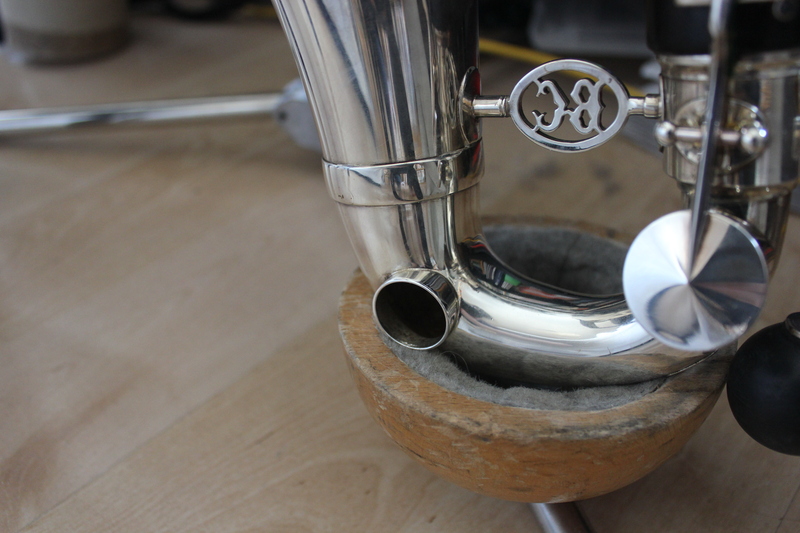 I’d say probably a little more time than changing from Bb to A clarinet, as one has to be quite careful in most cases that the preparation is properly covering the bell. I’ve never managed to find a way to change preparations while standing. It’s totally awkward to try to reach for the bell while harnessed into the instrument, and always seemed like too much of a risk to take the instrument out of the harness in the middle of the piece. So I’ve always had to play Einbond’s piece sitting down. Make sure the clarinetist in question is okay with having various things attached to the bell, or put inside the bell. My ratty old bell doesn’t seem to mind it and I’ve never scratched it or needed any kind of repair because of my preparation experiments, but its possible not everyone will feel the same way I do. Bluetack is your friend. This is what I use to seal the vent hole, and it’s what I use to protect the instrument from the metal edges of the bulldog clip. If you’re a composer, bring some along when you want to try these things out with a clarinetist. This preparation (as used by Einbond) is a piece of normal weight paper, laminated. 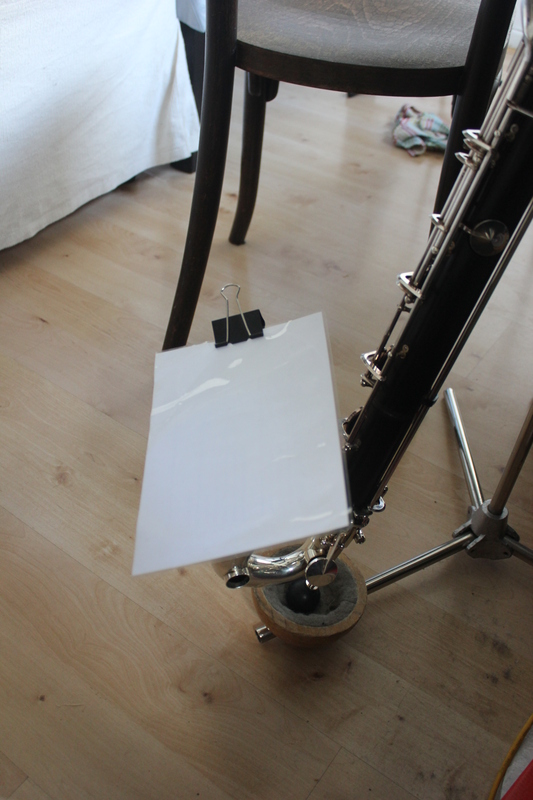 As with the card preparation, its fixed to the bass clarinet with a bulldog clip (the bass clarinet can be protected by gluing felt to the metal edges of the clip or by using bluetack). This isn’t actually paper. It needs to be a bit harder than that, a sheet of card. It’s actually not so easy to find the right balance, so having a few different thicknesses to try is probably not a bad idea. Do compare this with the sound of the plastic, however, it’s striking how different a sound world it creates, I think. 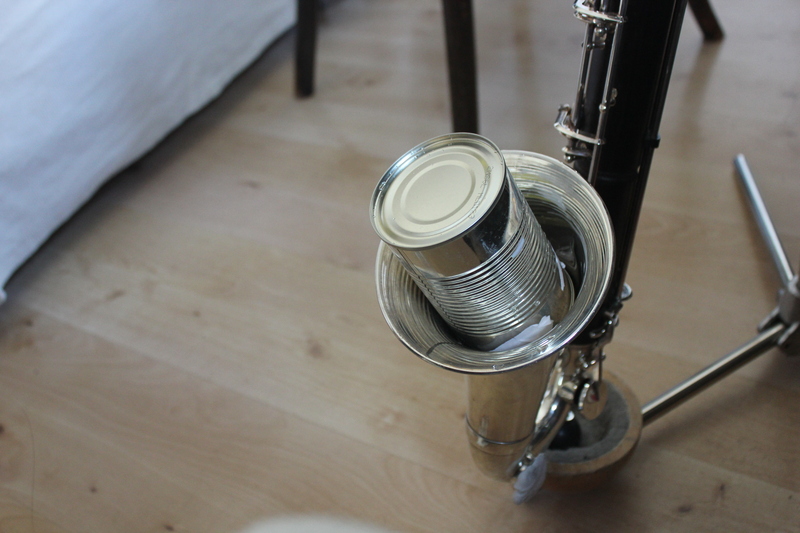 Don’t forget, when using aluminium foil it makes noise all the time, so best to build that into the piece somehow, if the clarinetist is ever going to change the preparation. It’s also best to always use a new sheet of the foil, as once it’s crumpled up it doesn’t make much noise. Okay, this is probably the most fun thing ever. But it’s also super important to check with the clarinetist and not assume they’ll be okay with doing this. 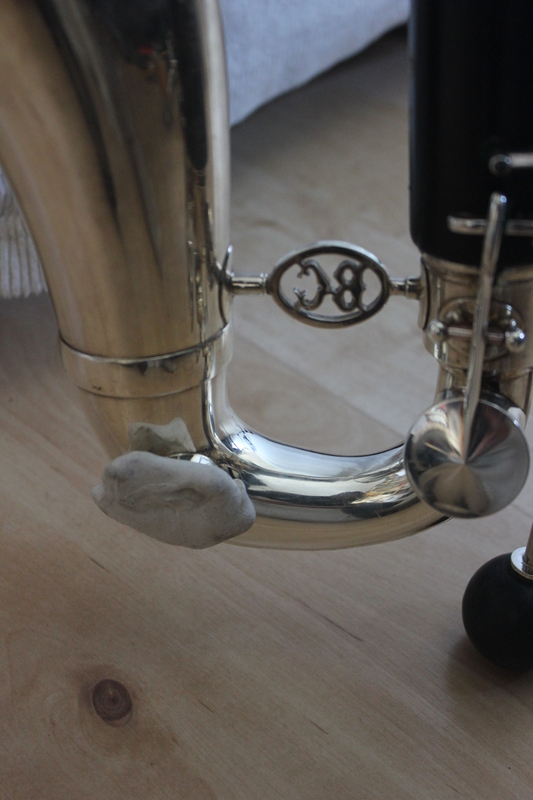 You don’t need a lot of water, but if you have a vent hole on the bass clarinet in question, it’ll need to be sealed (this is where your handy bluetack comes in!). Once the vent is sealed, add just enough water to rest in the bottom of the bell. Too much, and it’ll start to leak out of the low C tone hole. I’d suggest putting some towels down in case this happens, as it might do once playing begins. A bit of splashing will happen anyway, especially if you use slap tongues. Any questions? If you haven’t been to the blog before, be sure to check out my other posts on clarinet writing. This entry was posted in aluminium foil, bending, clarinet techniques, flutter tongue, multiphonic, on composing for the clarinet, performance, preparations, singing, spectral multiphonic, water and tagged bass clarinet, bass clarinet preparations, clarinet, collaboration, composers, contemporary music, new music, preparations, preparing bass clarinet. Bookmark the permalink. Hello Heather! A quick question: if only the low C activates the preparation, could you ostensibly play everything else normally with e.g. water in the bell?